Our Pre-School program will engage your child in a more structured and challenging academic schedule. At this stage, children engage in various types of play and learning in groups, independent, constructive, and pretend play. Gross motor skills will be developed where running, skipping, catching, balancing, riding, and playing in our playgrounds is likely. Will recognize that print is used as a form of communication in addition to speaking. 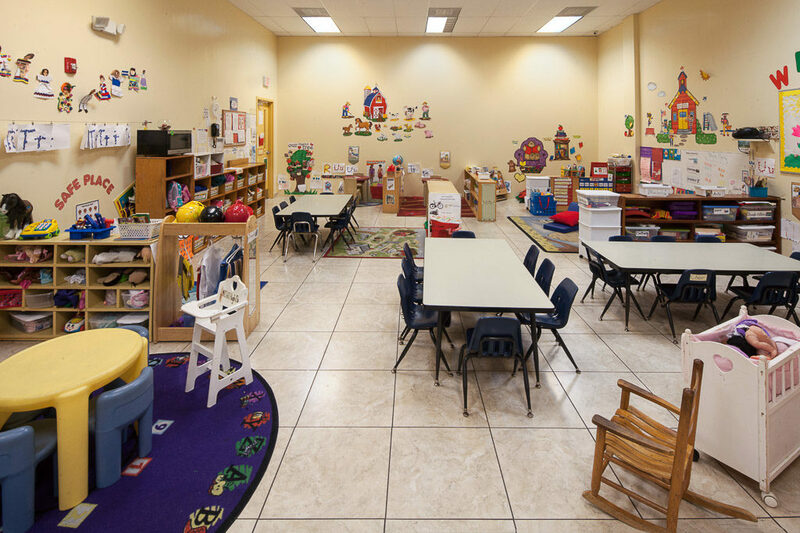 The classroom setting serves as a third teacher for the students, along with a variety of learning centers, print rich material, and natural materials from the environment are incorporated in the classroom. When conveying a message, your child will use complete sentences to communicate with their peers and adults. A day in Pre-School begins and continues in an active passive-mode throughout the day with table activities, journal, fine motor activities, outside play, computer, centers of interest and small groups promoting literacy/vocabulary/language: phonological awareness, comprehension, print words. Fun Math is guided through the common core standards established by the State of Florida: number concepts, patterns and relationships, geometry and spatial relationships, sorting and classifying among many hands-on Fun Math. During World of Learning, your child will build experiences in science, social studies and technology development.